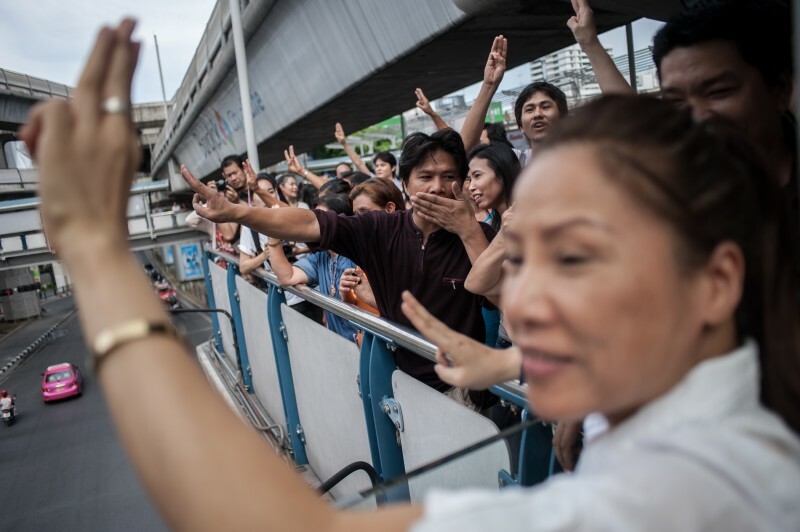 January: Tens of thousands filled the major intersections of Bangkok as opposition groups intensified their bid to topple the government of then Prime Minister Yingluck Shinawatra. The protest led by former lawmaker Suthep Thaugsuban aimed to ‘shutdown’  Bangkok for several days or until Yingluck is removed from power. February: Despite the anti-government rallies  and the boycott campaign of the opposition, Thailand was able to conduct a ‘peaceful’ election . But many Thais were unable to vote or prevented  from going near polling centers because of the protests. The number of disenfranchised voters was estimated at 12 million. March: Thailand's Constitutional Court annulled  the February elections by declaring it unconstitutional because voting failed to take place on the same day around the country. April: Street protests continue  to call for the removal of the caretaker government headed by Yingluck. She will eventually be forced to step down after the court ruled the following month that she abused her power in 2011 when she replaced the national security chief with one of her relatives. 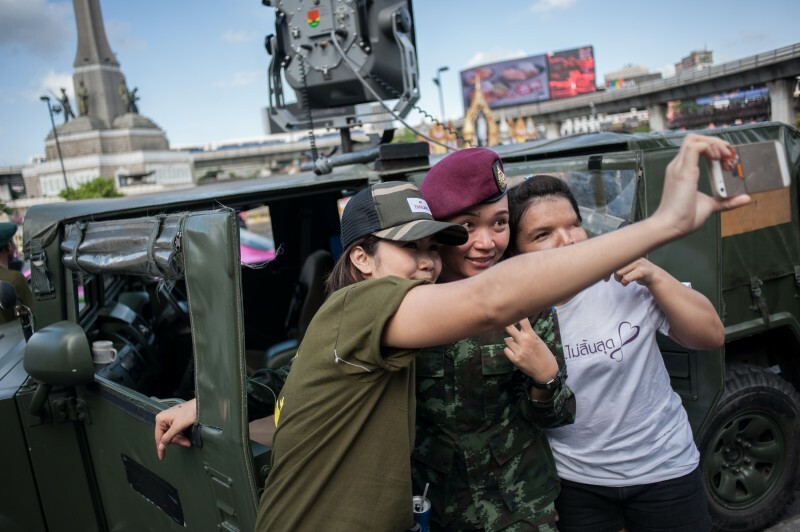 May: Two days after declaring martial law  and failing to mediate between rival political forces, the Royal Thai Army launched a coup  on May 22, suspended the 2007 Constitution (except provisions on the monarchy), seized control  of major media stations, and imposed a nighttime curfew. 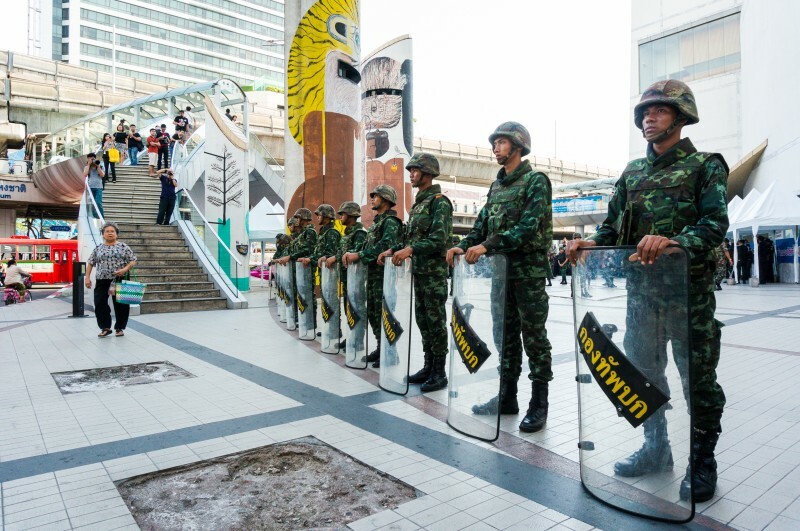 This was Thailand’s 12th coup ; but more than 20 if we include the unsuccessful coup attempts in the past century. July: The Junta issued a new order  banning media from reporting news that is critical of the government. Media groups immediately raised concern about the broad and vague provisions of the order. They also highlighted the severe punishment – legal prosecution, censorship, and shutdown – for violating any part of the order. August: The National Council for Peace and Order, the name of the junta government, enacted  an interim constitution as part of the purported roadmap of democratic reforms in the country. But critics have pointed out that the new charter is designed to perpetuate a military dictatorship. Using this constitution, General Prayuth Chan-ocha was selected  by the National Legislative Assembly as Thailand’s 29th prime minister. September: The deaths of British backpackers Hannah Witheridge and David Miller in Koh Tao island beach resort greatly embarrassed  the military-backed government before the international community. The police was accused of bungling the investigation after failing to apprehend suspects and file appropriate charges in the court. October: For many months already, students have been ordered  to memorize Prayuth’s ‘12 Core Values’ which focus on discipline and respect for authority. Some students have dared to protest  this reform and other curriculum changes, which they said were done without consulting  the public. Another reform dubbed as teaching ‘correct democracy’ was the revision  of history books which allegedly already removed the name of former Prime Minister Thaksin Shinawatra. November: Additional troubling signs of censorship : The media was asked  by Prayuth not to report the activities of Thaksin and Yingluck, a TV host was replaced  because the junta did not like her critical comments about the government, and the Hunger Games film was banned in some theaters and protesters were detained  for doing the three-fingered salute.